Mouth guards are typically associated with sports such as football and boxing. Most people think of them as a means to protect your teeth from damage while playing contact sports. 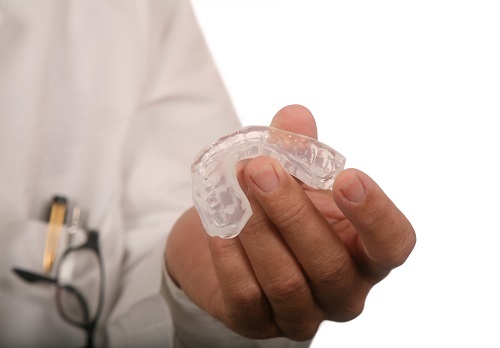 But mouth guards have evolved as research progresses and now they are used for more than simply protecting your teeth, they can actually help you sleep better. If you suffer from sleep apnea, snoring or anxiety that causes you to grind your teeth, read on. The solution for your problem is right around the corner (or further down the page). Mouth guards are custom fit for your teeth. A custom fit solution keeps your jaw in a forward position which prevents the airway from collapsing. This keeps your airway open and helps you breathe better. That in turn helps you sleep better. No longer will snoring wake up your partner nor will you wake up because you can't et a breath due to sleep apnea. If you suffer from grinding your teeth, the mouth guard will prevent your teeth from destructive grinding. The two surfaces will no longer be able to wear down the surface of your teeth, which causes them to break or crack and invites dental caries. If you suffer from sleep apnea, snore excessively or grind your teeth, make an appointment with your dentist. Tell him what your nightly problem is. He will take a look at your jaw, your teeth, your airway and your tongue. You may also need a new set of x-rays. Your dentist will then make a digital or physical impression of your teeth. The models will go to a dental lab where your new mouth guard will be made. Once your dentist gives you the new mouth guard, you will come back for follow-up visits so your dentist can make any adjustments that may be necessary to ensure it is as effective as possible.